In a pewter gray hue, this bell lamp shade features trim along the top, bottom and ribbing. Give any table lamp a new look with this stylish bell lamp shade. The softback shade features a soft pewter gray color throughout as well as the top, bottom and ribs. With a white lining and polished brass spider fitter. The correct size harp is included. From Springcrest Collection™. 7" across the top x 12" across the bottom x 9" on the slant x 8 1/2" high. Softback bell lamp shade. Design by Springcrest Collection™. Pewter gray color fabric. White lining. Trim on top, bottom and ribs. Polyester fabric for outside and lining. Polished brass spider fitter. The correct size harp and a finial are included free with this shade. The shades will look nice with our two floor lamps in the baby nursery. Because it will fit my Black Lamp !! 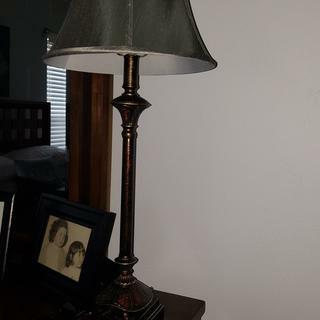 Replacement shades for lamps I own and like. These appear to be a size and color that will work. Getting new sofa and chair and love this color to match them. Delivery was fast and they arrived in excellent conditions. A very soft, current yet eloquent shade. The color blends well with a relaxed shade of gray. It matched my desire to upgrade my bedroom style. A double sheer lamp shade in a silver and white drum shape topped with a silver finish spider fitter. A medium gold drum lamp shade with slim silver trim in a lovely satin material with a chrome finish spider fitter.